A RITUAL THAT DOESN’T WORK. Who came up with this idea, anyway? Blame the Babylonians and Romans who used their new year to reaffirm allegiance to the gods as well as to lesser but still powerful mortals like kings or emperors. Much later, in 1740, John Wesley developed a religious alternative to holiday partying. These watch night services were held as a renewal of the covenant with God. Resolutions ran with a powerful crowd. Ironically, less powerful are today’s resolves, which are about inwardly personal behaviors rather than loyalty to something greater than ourselves. 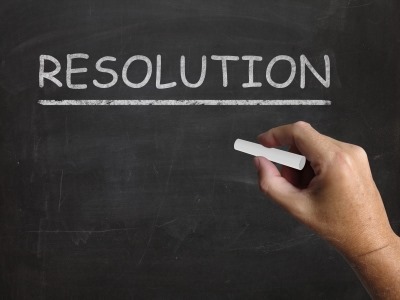 Resolutions about mental health and wellness concerns like partnering, parenting, drinking, drugging, smoking and eating are peer- and culture-expected but given lip service. In an attitude of predetermined failure, resolutions about important behavior changes are almost expected to be broken and quickly forgiven when they are. Promises expected are promises unkept. That’s how I feel about New Year’s Resolutions. Besides, I think most of us change not because we’re supposed to, or even want to, but because we choose to, sometimes for not-very-good reasons. Change is something much greater and often tons more weighty and harder to handle than a New Year’s resolution. Those choices and changes can’t be scheduled for a certain day, like January 1st. That’d be about as meaningful as marriage vows made in an arena full of other couples. If that’s anything like the resolutions actually kept, about half of those couples are headed for a split after only a month together. Sitting here at the end of December, I’m in solid company: According to a 2013 CBS poll almost 70% of Americans don’t make New Year’s resolutions at all. I just hope none of them were married in an arena.